As a specialist in the case erector industry, Combi is constantly incorporating new technology into our impressive portfolio of equipment. The Combi HCE case former offers high speed case erecting up to 35 cpm while achieving efficiencies in power and air usage and reducing overall machine size. 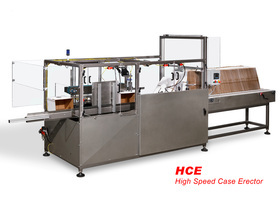 Capable of erecting and sealing cases with adhesive tape or hot melt glue, the Combi HCE bottom case sealer is built with heavy-duty mechanical components and rugged welded tubular steel construction.